Next in the series on Just Smoked Salmon is this Candy Jerky. See my previous review of their Teriyaki Jerky. 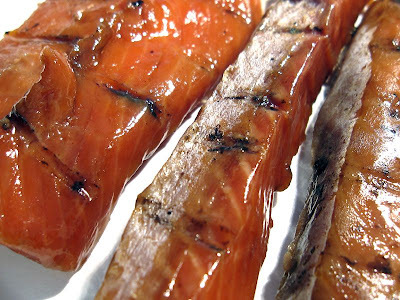 Just Smoked Salmon is a brand name of Wright Distributing, Inc., based out of Port Angeles, WA. Even though the company uses the word "jerky" on their labels, it doesn't actually appear to be jerky as I discovered with their Teriyaki Jerky. I've reviewed other brands of salmon jerky and found them to be chewier, and more dry. This stuff is actually very soft, and very moist. It's just smoked salmon as the brand name says. This Candy Jerky is what I believe to be traditional "squaw candy", which is effectively a sweetened salmon jerky. Except, I'm sure in this case, it's standard smoked salmon, as opposed to salmon jerky. Cured with water, sugar, salt. The first thing I taste from the surface of these pieces is a smoky flavor, followed by a sweetness, and a fishy flavor. Overall, a moderate surface flavor intensity. The chewing flavor starts with a saltiness, followed by a smoked salmon flavor, and more sweetness. For being advertised as "Candy Jerky", it's definitely sweet, though not heavily. It actually seems to have the same level of sweetness as the Teriyaki Jerky I reviewed last week. It's easily noticed on the surface flavor, and in the chewing flavor. Otherwise, the smoked salmon flavor is largely the dominant flavor of this Candy Jerky. It has the same smoked salmon flavor that you'd expect to find in most other brands of smoked salmon. The saltiness seems to be at a moderate level, more noticeable in the chewing than on the surface flavors. Overall, this tastes like a simple smoked salmon filet, with a moderate amount of sweetness added. These are filets of salmon, sliced thick, and in lengths of about 3-4 inches. These are very moist, and quite wet/oily on the surface. It's very easy to bite off chunks, and in fact the meat pulls apart with the grains just as you'd expect with smoked salmon. Chewing is very easy. The chewing texture starts out feeling tender and moist, and chews down easily with no resistance. At that point it feels just like chewing a piece of cooked salmon, not mushy, not crumbly, but like real salmon meat. I don't find any pieces of fat on these filets, and encountered no bones or anything unchewable. Some pieces have some thin layer of skin, but I found they didn't affect the flavor or chewing. In terms of clean eating, these filets are very wet and oily on the surface and each handling requires a finger licking and wiping. 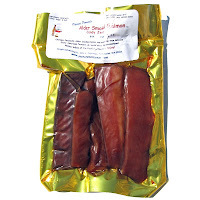 Just Smoked Salmon sells this Teriyaki Jerky from its website at a price of $11.96 for an 8oz package. I bought two packages, one of this Teriyaki, and their "Candy Jerky". Add to that shipping costs of $12.35, and the total came to $36.29. That works out to a price of $2.27 per ounce. For general jerky snacking purposes, at the $2.27 price per ounce, it's a decent value. It provides some good snackability for its good overall flavor, moist easy eating, and good chewing texture. The $2.27 price per ounce is more expensive than the mass-market brands of jerky you'd find at the grocery store, but this seems to provide much more snackability. As a "Candy Jerky" and a salmon jerky, at the $2.27 price per ounce, it's a fair value. First, it's not really a jerky, this is still too moist to be jerky. Second, as a candy jerky it's sweet, but I expected something more sweet than this, at least to live up to the "candy" moniker. This Candy Jerky from Just Smoked Salmon has a moderate amount of sweetness both in the surface and chewing flavors, but heavily sweet as I would expect something called "candy". Otherwise, these are just standard filets of smoked salmon with some noticeable sweetness. It's quite tasty for its own merits, tasting smoky, just like cooked salmon, with some a fair amount of saltiness. But I think this is still too moist for salmon jerky. Other brands of salmon jerky I've had were more dry and chewy than this. 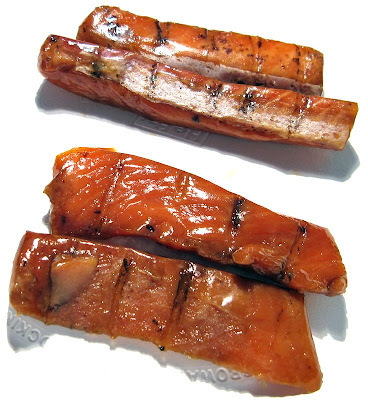 If you're specifically wanting something more dry and chewy, you'd probably be dissatisfied with this, but I think most folks who love the taste of smoked salmon will enjoy this a lot, especially with that moderate sweetness. A good beer pairing that sounds good right now is an IPA. Has anyone tried Nature's Catch smoked salmon jerky? Is this stuff any good? I'm thinking of buying some on amazon but wanted some opinions first. Anything would be much appreciated. Thx!